GEORGE TOWN (July 27): The DAP has asked its Pakatan Harapan partners to not follow the 'eye-for-an-eye' adage, when deciding on the snap polls call for Penang. Its secretary-general Lim Guan Eng said the party would persist on convincing the coalition partners, which have yet to give a definitive answer on the call for a snap poll in Penang. The snap poll was an idea mooted by DAP to enable Penangites to 'pass the verdict' on reviving and restoring hope for the future, after the alleged abuses of power that allegedly affected the economy and development. “We will continue to discuss with our partners, but it should not take too long, otherwise it would not be practical. We hope to convince our coalition partners in Pakatan Harapan, based on respect. “We should not follow old practices of 'an eye for an eye'. If we did that, in the end, it would leave everyone blind. 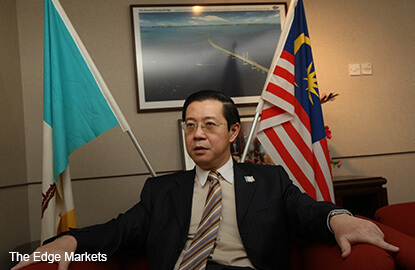 That should not be the approach,” said Lim, who is also Penang Chief Minister in a press conference today. Lim was believed to be referring to PKR communications director Fahmi Fadzil who allegedly 'countered' Lim’s claims that PKR 'acted unilaterally' in past state and parliamentary by-elections, such as Permatang Pauh, Penanti and Kajang. Fahmi said there was a huge difference between a single-state by-election and state-wide election, where a single state election is held by one political party and the latter involved more than one party. Yesterday, PKR president Datuk Seri Dr Wan Azizah Wan Ismail said the party would rally behind Lim, who was facing two corruption charges brought by the Malaysian Anti-Corruption Commission (MACC). However, PKR remained unconvinced with the idea for the polls, and would send a top leadership team to voice its views to DAP soon. Newly-formed political party Amanah, headed by Mohamad Sabu, has instead taken on the 'wait and see' stance on the polls talk. When asked if DAP was prepared for PKR’s disagreement, Lim said it was best to discuss, instead of speculating a response, as it does not help in productive discussion. Asked about any timeframe placed on PKR to decide, Lim said he was told that the party would meet soon and DAP would not 'push' them. “We did not give them a timeframe, but they are expected to decide in a short space of time. We cannot leave the matter undecided for a long time. We have provided them with the reasons for the snap election. “The reasons are not only for me to continue heading the state government and fight the trumped up charges against me, particularly in light of the RM13 billion 1Malaysia Development Bhd (1MDB) scandal in the United States,” he said. On the possibility of postponing the snap polls to next year, Lim said it had to be within 'a reasonable time'. “Next year is not feasible. We cannot fix a timeframe, but next year is not possible at this present moment. If you talk about (snap) election, it has to be done quickly. It cannot be dragged, unless there are new or changed circumstances,” he said. Lim dismissed talk that he had no confidence in his leadership in retaining the state in the 14th general election. “The same can be said that if we have no confidence now, then how can we have confidence in winning in two years, despite the latest explosive revelations of 1MDB. “I think this can be postulated in this manner. We want to do an accounting. It is up to the people to agree or not. Otherwise, there is no avenue for them to show. We are of course confident of our support here, but final verdict would be at the polls. Let this be the first call for justice and accountability for Penang,” he said.